1981 John Moshides enters the financial services business. 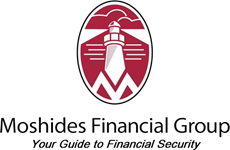 1987 Moshides Financial Group, Inc. (MFG) is created to provide financial planning services directed towards business owners and professionals. The office is located in Liberty Building in downtown Buffalo, New York. 1991 John W. Elsnau develops financial planning and asset management department at MFG. 1992 John Moshides earns his Charted Life Underwriter (CLU) designation. 1994 MFG relocates to Main Street in Clarence, New York. 1998 John joins the Give & Grow Study Group as a founding member. A national group of financial advisors committed to life-long professional improvement and sharing of best practices. 1999 John serves as President of Society of Financial Service Professionals – Buffalo Chapter. 1999 John enrolls in Strategic Coach Program. An internationally recognized entrepreneurial program designed to provide a platform for personal and professional lifetime growth and improved capabilities. 2001 MFG creates investment research team to guide portfolio construction. 2003 MFG relocates to their own building at 65 Bryant Woods S in Amherst, New York (current location). 2005 John earns Certification in Long Term Care planning (CLTC). 2008 John serves as President of National Association of Financial Advisors – Buffalo Chapter. 2009 John earns Chartered Financial Consultant designation (ChFC). 2009 John earns Accreditation in Estate Planning (AEP). 2010 MFG enrolls in Peak Advisor Alliance coaching program designed to improve office operations and client service. 2013 Total assets under management reach $100,000,000. 2015 Jeffrey Wohlfahrt assumes duties of Director of Financial Planning. 2015 Benjamin Whitford serves as an intern at MFG during his junior year at Canisius College. 2016 Jeff Wohlfahrt assumes position of Director of Asset Management for MFG. 2016 Benjamin Whitford joins MFG as a financial advisor. 2017 Total assets under management $240,000,000.